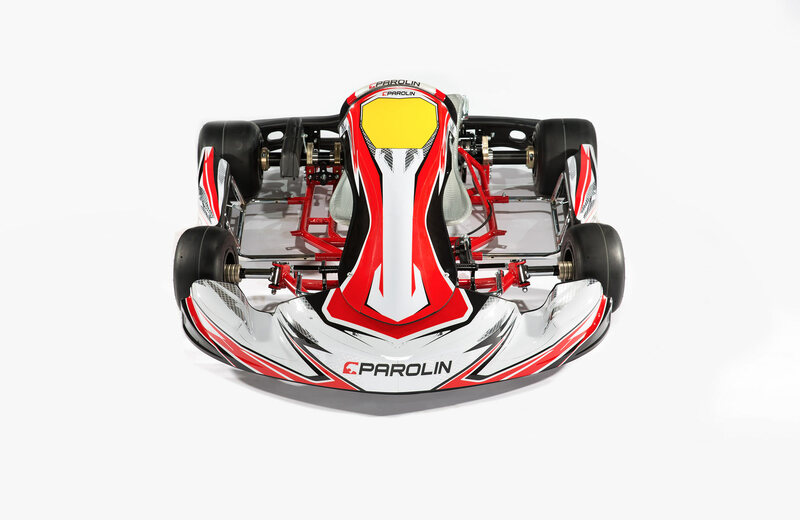 Chassis are made of seamless special CrMo steel tubes of diameters 30 mm (1.18 in) and 32 mm (1.26 in). High-precision tube cutting and welding are performed using laser technology machines, while tube bending is processed through state of the art CNC machines. Components are obtained from best aluminium and magnesium solid pieces and then titanium anodized, the first being done with high-tech fully automatized machines and held to tight tolerances. 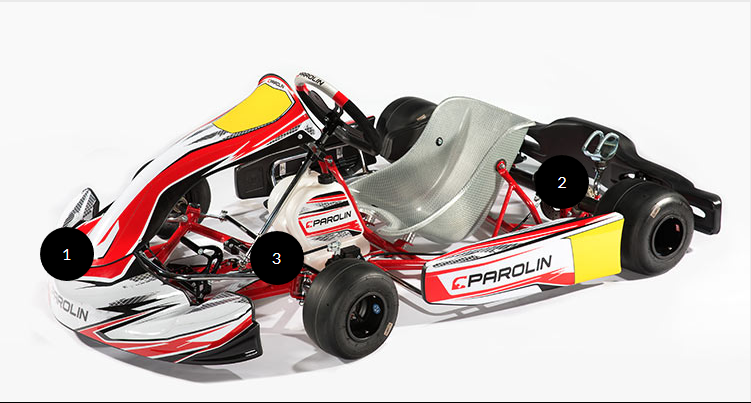 All these operations are performed within Parolin Racing Kart’s facilities. Wheelbase ranges from 1045 to 1050 mm (see chart below). Stub axles are cut from a single steel piece. 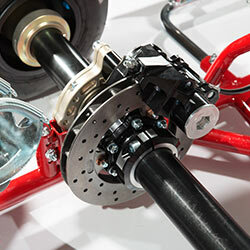 Ackerman geometry, camber and caster are easily adjustable thanks to the innovative Eurostar eccentric system. 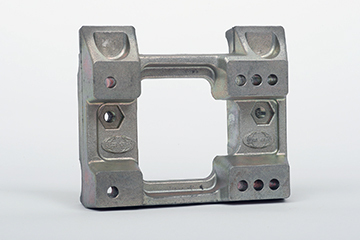 Pedals are made of aluminium and present an ultra-low friction attachment system that provides enhanced sensibility. 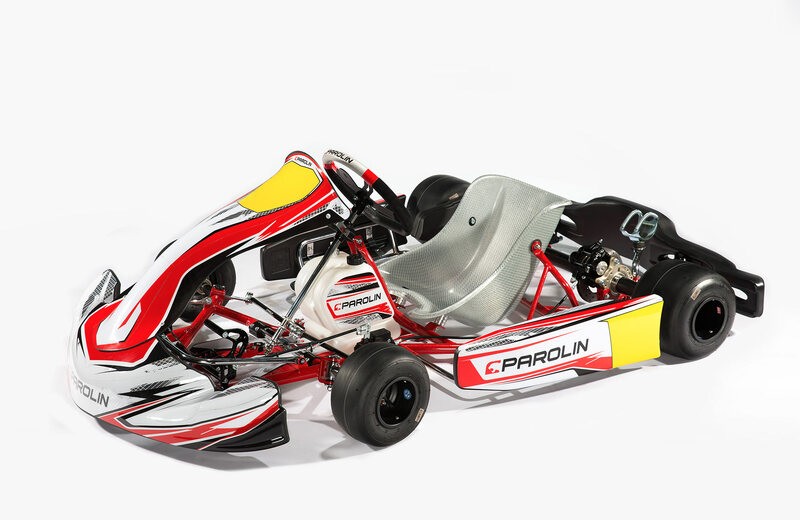 Brakes are hydraulic self-adjusting CIK FIA homologated AP RACE 06. Rear brake rotor is 194 x 18 mm or 199,5 x 12 mm in diameter, all made of Cast Iron and ventilated. Optional hand operated front brake is available. Brakes, as all components, are produced within our facilities. 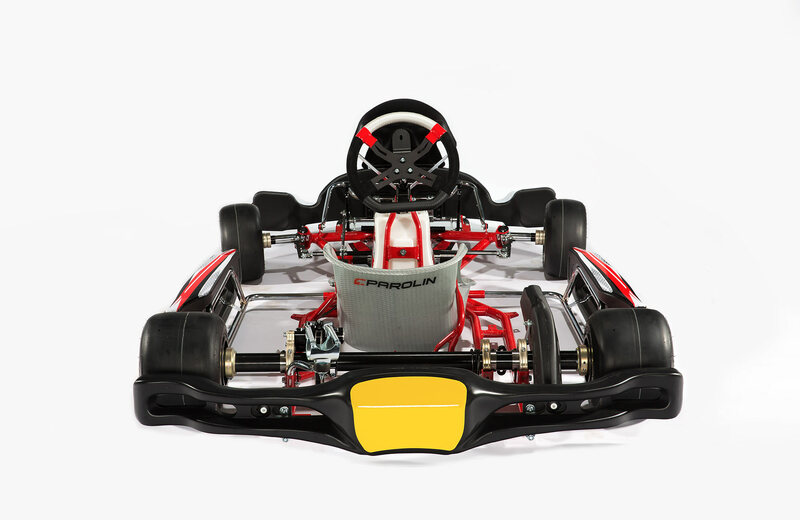 It presents front and rear removable stabilizer bars in order to adjust the rigidity parameters. 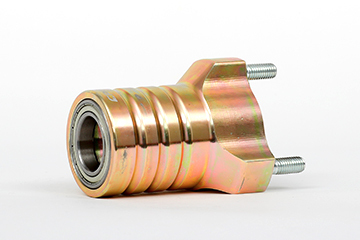 Rear axle is supported by three bearings with special cassettes and is 50 mm (1.97 in) in diameter. Optional 40 mm (1.57 in) is available. The seat is manufactured in fiberglass and engineered using the latest ergonomic techniques. It also presents a controlled torsional stiffness. 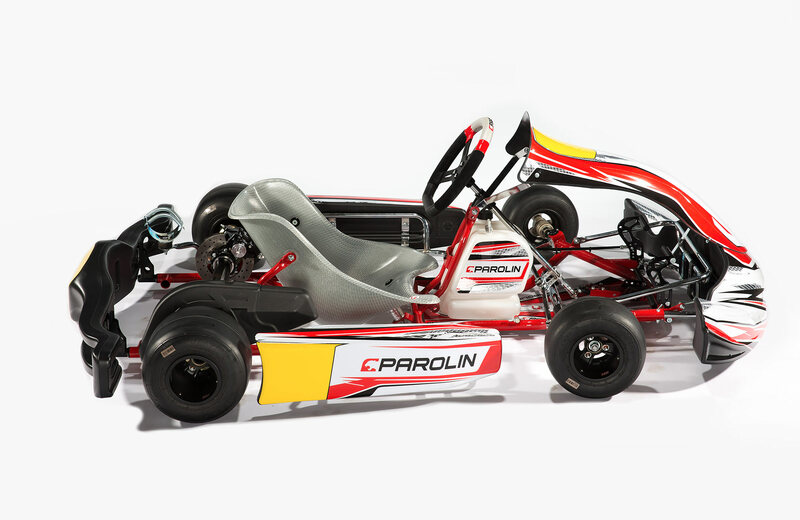 The new aerodynamic streamlined bodyworks Eurostar Dynamica and Wings are performed within Parolin Racing Kart's facilities. Wheels are 210/130, made of magnesium, anodized, heat-treated and present a triple bead retention system. It presents right-left extra seat supports. The anatomic steering wheel is mod. 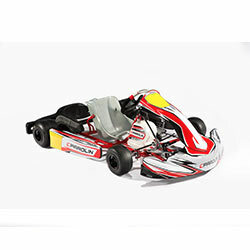 Motorsport 322 mm (12.68 in) aluminum made. 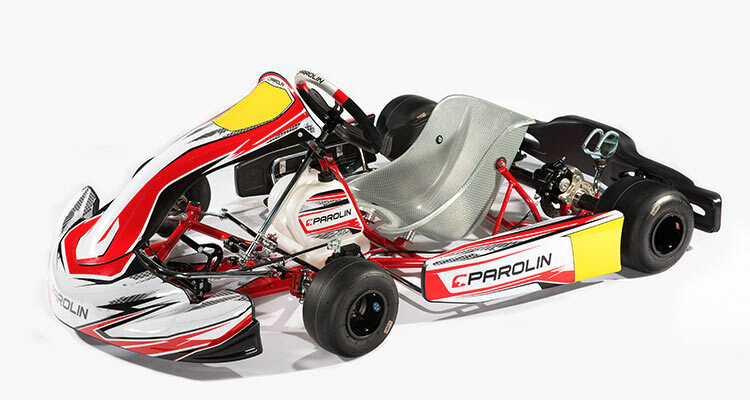 Chassis are powder coated in Parolin red color and are CIK FIA homologated. Of various lengths, both at the front and rear. They have resulted in a reduction in the weight of the rotating masses as well as different setup possibilities thanks to the different mechanical properties of magnesium. 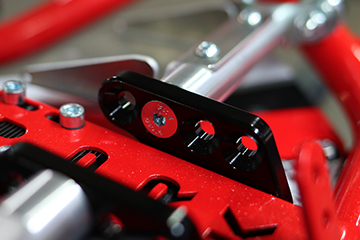 The Teflon bar allows the adjustment of the chassis setup according to different track grip conditions. 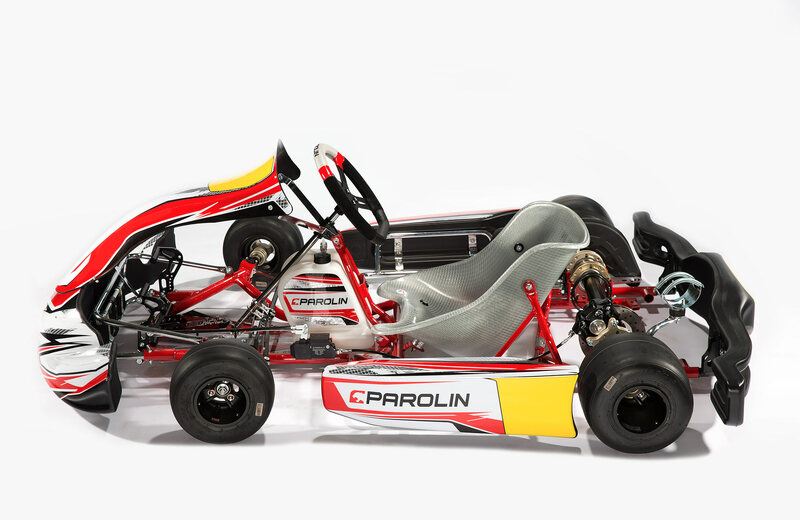 The magnesium engine track gives a significant reduction in weight. The new Dynamica fairing kit was developed in a wind tunnel. There are many advantages, from increasing the load at the front, to the reduction of turbulence created by air flows the driver is subjected to. The front spoiler also channels air towards the radiator, the braking system and the engine to improve cooling. 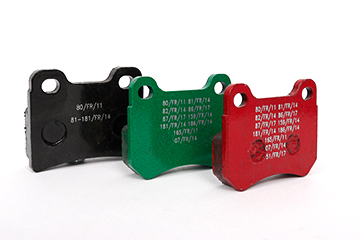 The latest generation AP06 braking system is composed of a single block caliper machined from a solid piece. This choice has allowed a considerable increase in rigidity for an increase in braking force. 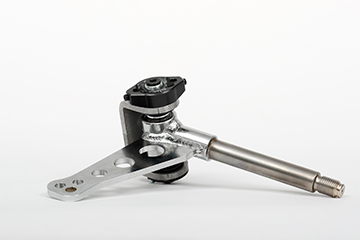 The caliper has a radial connection to reduce torsion during braking. 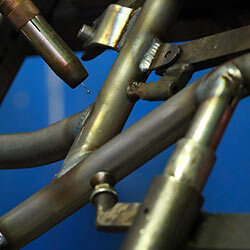 The welding of the chassis is carried out completely by a robot, which gives different advantages, including the uniformity of the products and safeguarding the mechanical characteristics of the tubes that make up the chassis.